To the Irish, Ireland is the promised land, an island prosperous enough to ensure the lowest rung of society have a decent standard of living. 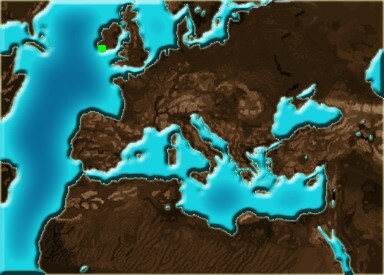 Events outside the island hold little significance to the common man predominantly due to its isolated geographical position, but nevertheless the Irish, who are accomplished sailors, trade as far away as Persia but most notably with Byzantium. They trade a valuable resource, the knowledge of the Greeks preserved in the books of the Irish monasteries that were lost in Europe during the dark ages, and use it to trade for materials and weapons the islands resources cannot give them. The island itself is sub divided into five provinces, Munster, Leinster, Connaught, Ulster and the seat of the High King in Meath, with all these provinces sub divided into small "kingdoms" or tuadhs with an elected leader. Warfare between the provinces is common, and as a result the Irish are more than capable warriors with all men required by brehon law to be equipped and trained to fight, with many doing so abroad for profit as mercenaries. The tuadhs and provinces resist any overtures from natives or foreigners on their territory fiercely, but much of the infrastructure of the island, such as the timber highways that cross it, have suffered as a result. There is, however, a continuing trend toward true unity of the islands provinces under the High King. The Irish are nominally united under this High King, a position which entitles its bearer to authority over all when it comes to military matters. However this is rarely the case, with the provincial kings and regional chieftains seeking to expand their power and influence with no effective opposition from the king. The current High King is Turlough O'Brien, grandson of the great Brian Boru, but his position is weak and his rule is contested. He does, however, have undisputed control of the Kingdom of Thomond and with it power in the greater province of Munster, which was more than enough of a starting point for his grandfather on his way to uniting the provinces of Ireland. The battle of Clontarf on Good Friday, 1014, saw the death of Boru and his closest family members repelling a Viking invasion force, and with no clear successor surviving the battle the regional chiefs again found an opportunity to try and gain power for themselves. Now, some 70 years after Boru's death, can a strong ruler of his line once again unite the Irish under one banner, or go even further and emulate the legendary Niall of the Nine Hostages by not only ruling Ireland but gain lands in Britain and the continent? Criosacinna, nobles fighting in excellent equipment paid for by the church. The Rastriaga are generally religious fanatics and usually very well trained and very intelligent, armed with high morale and a hammer to smash their foes. The best Irish archers available, armed with a bow, mail and hand axe, these archers are good in a fight. Bog standard Irish archers, armed with a short bow and a scian. Irish regulars, these spearmen are also equipped with javelins and shields that fought in tight formations akin to a shield wall to hold lines. Ridire are the elite of Irish society and their bodyguards, the bravest and most ferocious fighting men from their regions. Well trained, but sometimes reckless men armed with pikes, able to form a wall of pikes against cavalry. Fianadi are professionally trained Irish infantry armed with javelins, a short sword and a shield. Gasógs are scouts who scirmish with a bow, but cannot not be relied on in hand to hand fighting. Saighamilidha means 'Bow Champions', they are ridire or nobles who prefer to use a bow, but are adequately equipped for hand to hand fighting if needed. Marcach are soldiers mounted on ponies who are used by the Gaels to skirmish and run down routers while also enjoying a powerful enough charge to break a weakened enemy position. Ostmen were Vikings who settled the coastal towns of Ireland who wore mail with a helmet and armed themselves with axes and throwing javelins who fought from horseback. Fast, manoeverable units that make good use of javelins. Excellent ambushers.